These candlesticks were given to me by a friend. While I loved the shape of them, the color was just a little blah for my decor so I decided to spray paint them Colonial Red (by Rustoleum) in a matte finish. I bought the spray paint that I intended to use in the dead of winter - not at all a season conducive to spray painting - and then stored my paint next to my blah candlesticks on my project pile for months. When the weather was finally decent and I got to painting, I used the entire can of paint trying to cover all the twists and turns on these things. Of course I missed a few spots, and as luck would have it Colonial Red in a matte finish was the only color, from the hundreds of colors made, that was being discontinued. Seriously!!?? After a minor panic attack and several phone calls to every paint store I could think of trying to track down a rouge can, I bought a can of Colonial Red in a glossy finish, gave these guys another spray and called it good. They are a little shinier than I would have liked, but they will do. From this simple candlestick transformation I have learned that I should not have bought the spray paint so long before using it. Had I bought it, brought it home, and sprayed it, a second can may have been available to me when I needed it. Because according to the paint guy at Home Depot they had just marked my paint as discontinued. Lesson learned: Buy spray paint and spray it....just in case you need a second can. 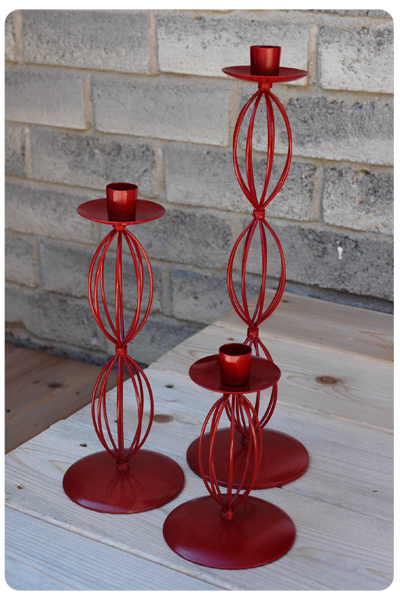 Hi, Love the color on these candlesticks, perfect for the upcoming holiday season. They would look great with some Kapula candles. That is exactly what I was thinking, Claire. 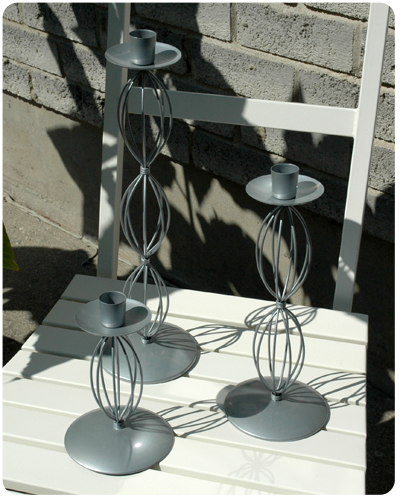 I was planning on arranging them with some white candlesticks for a festive centerpiece.